ONE WORLD ONE OCEAN - In the role of guardians of your geographical regions, there is also a responsibility to develop the blue economy for the international circular economies that a sustainable society requires if we are not to burn planet earth out. The Cleaner Ocean Foundation is totally independent of any Government or Non-Governmental organization. Our Foundation did not qualify for funding grants when it mattered most. Making applications for such funding is onerous, time and money sapping and ultimately, only the big corporations get a look in. Social and not for profit enterprise remains unsupported, except by contributions directly from the public. That has been our experience to date. We are though pleased to learn that the G7 are injecting funds where they can in the hope of attracting ideas. If this plan works, we can take a back seat and rest easy. So please apply if you have the backing to do so. ‘Innovation challenges’ are a recognized and effective mechanism by which solutions can be developed and implemented in an economically viable way, as well be responsive to countries’ needs and target recipients. While respecting each participating member’s expertise and reflecting national priorities, G7 members commit to undertake international and/or domestic initiatives, individually or jointly, in support of a common objective to promote innovation in addressing marine plastic pollution by managing plastics more sustainably throughout the whole life-cycle. 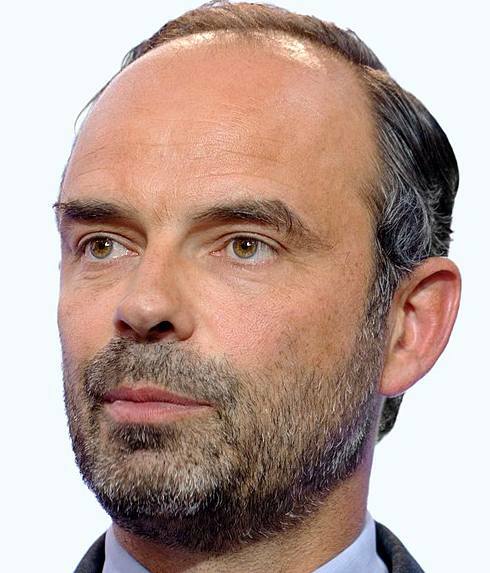 G7 plastic initiatives will respond to varied individual country needs accordingly. For example, domestic initiatives could focus on plastic design or recycling questions in accordance with national needs, while international efforts could respond to the need for support in improving waste management systems or creation of secondary markets. G7 members commit to sharing information their activities in support of this Challenge through the G7 Alliance on Resource Efficiency. * Leverage, build on, and complement existing initiatives throughout the plastics lifecycle. * Leverage the strength of a diversity of expertise, including entrepreneurs, innovators, small to medium enterprises, researchers, not for profit organizations, and/or large multi-national companies. * Support gender equality, women’s empowerment and women’s leadership. * Encourage innovative solutions that are sustainable, feasible, lasting, economically viable, and scalable (scaling up of an existing initiative; or developing new initiatives that can be scaled up through mechanisms such as blended finance) as well as reflect local and regional circumstances and gender dimensions. * Develop and maximize effective relationships by leveraging implementation mechanisms including international financial institutions such as the World Bank, Inter-American Development Bank, and Asian Development Bank, as well as pursuing alternative approaches including philanthropic foundations. 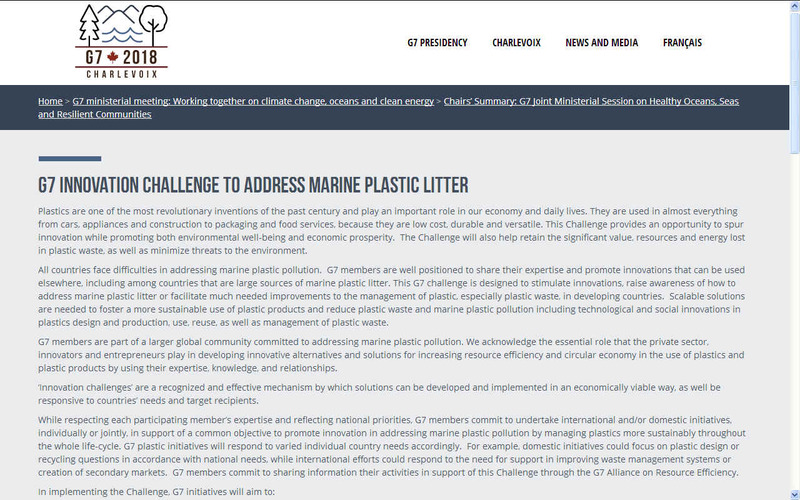 *The overall objective of the Challenge is to incentivize the development of innovative social or technological solutions for a more sustainable management of plastics throughout their lifecycle in order to increase resource efficiency and to reduce marine plastic pollution including by finding innovative ways to enhance waste management of plastics that may become marine litter. 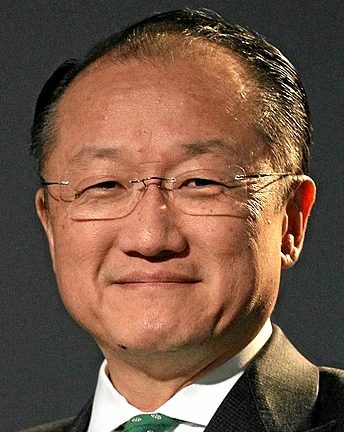 Multilateral organizations efforts such as World Bank Problue – new umbrella multi-donor trust fund in support of the Bank’s Global Blue Economy Strategy through consultations with their governing bodies. MARINE PLASTIC - The above initiative is focused on preventing source plastic from entering the sea, leaving out the fact that millions of tons remains in our oceans and that no matter how well we manage plastic on land, enough plastic to harm marine eco systems will still find its way into the stomachs of marine organisms, with the carcinogens ending up in humans. What is new about this G7 move is that awareness is now firmly on the agenda. The World needs a dedicated Ocean Action Plan, working in conjunction with land based reductions, to coordinate the efforts of member nations that in turn will benefit each other as the oceans move from one shoreline to the shores of a neighbor country as witnessed by beach litter. We need this to ensure future food security where the global population is still rising and land is being used for housing to accommodate the additional families, the ironically, our success as a species has allowed us to take control of planet earth in spite of the right of other species to live undisturbed. To help us develop an international strategy we need to generate sufficient funds to effectively make headway, estimated to be in the region of $10 million US dollars to develop a SeaVax prototype. Follow on expenses, or pledges of ongoing support should be included to cover the cost of helping contributing nations to set up fleets of ocean cleaning boats - and running them in a network of satellite (assisted) guided ocean dustcarts that stands the best chance of regenerating our oceans. 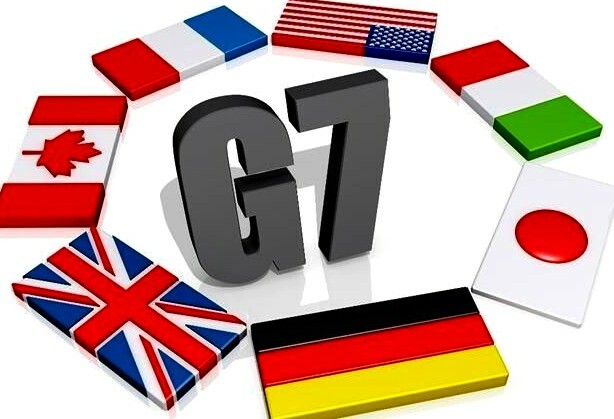 The G7 (or Group of Seven) is an informal grouping of seven of the world’s advanced economies consisting of Canada, France, Germany, Italy, Japan, the United Kingdom, and the United States. The forum offers an opportunity for G7 Leaders, Ministers and policy makers to come together each year to build consensus and set trends around some of today’s most challenging global issues. In 2018, the leaders gathered from June 8-9 at the Fairmont Le Manoir Richelieu, in La Malbaie, in the Charlevoix region of Quebec, Canada. The group has met up regularly since 1976 to discuss key issues related to global economic stability. 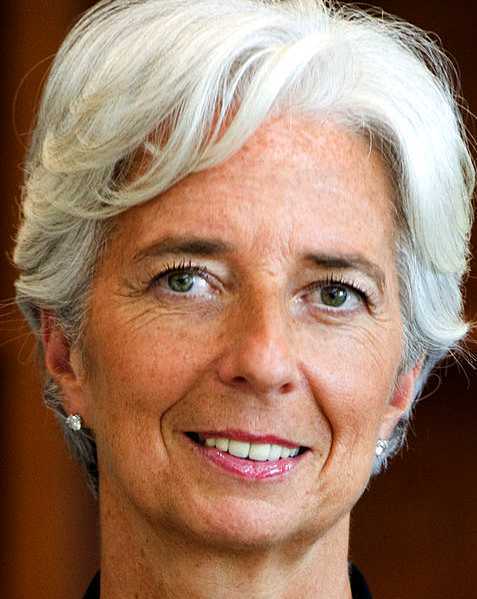 The G7 comprises Finance Ministers and Central Bank Governors of 7 countries: Canada, France, Germany, Italy, Japan, the United Kingdom and the United States of America. 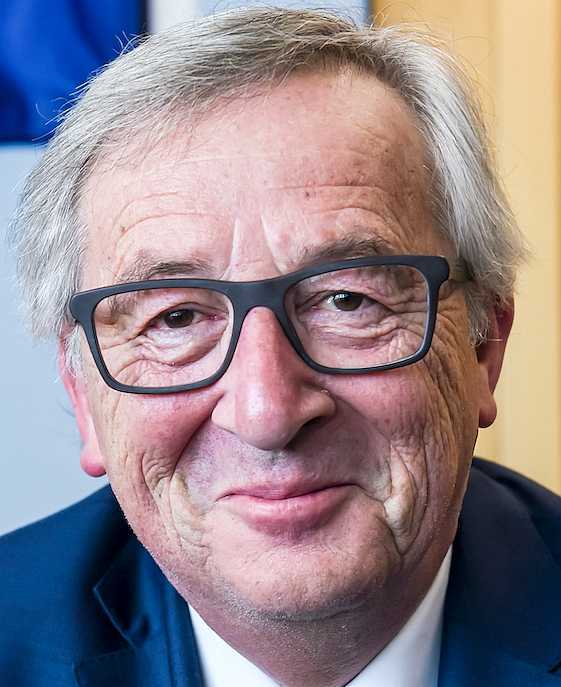 Representatives of the European Union, including the EU Presidency and European Central Bank, as well as heads of international financial institutions also regularly attend. 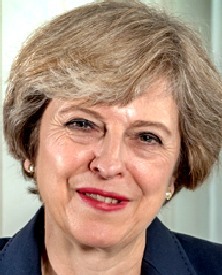 In 2013 the UK assumed the Presidency of the G7 hosting a meeting of Finance Ministers and Central Bank Governors on Friday 10 May and Saturday 11 May 2013. The representatives attending the meeting in 2013 are shown in the tables below. 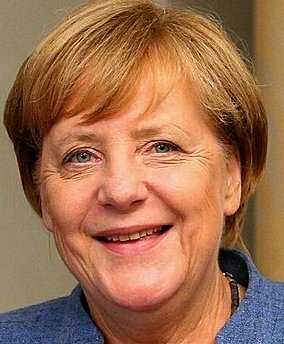 In 2014, the 40th G7 meeting was held in Brussels as an alternative meeting without Russia, so going from the G8 to the G7, due to Russia's association with Crimean crisis. The 2014 G8 summit in Sochi was cancelled and re-located to Belgium, The Hague without Russia as an emergency meeting in March 2014. 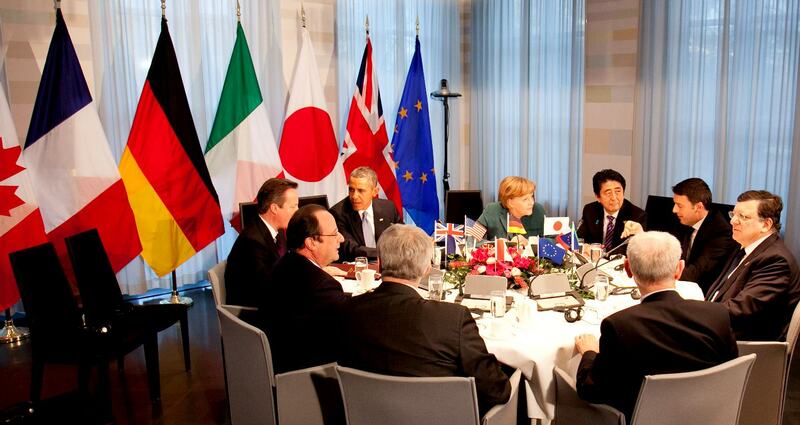 In 2015, the 41st G7 meeting was held hosted by Germany at Schloss Elmau, Bavaria. The summit was dedicated to the global economy as well as on key issues regarding foreign, security and development policy. The Global Apollo Programme was also on the agenda. In 2016, the 42nd G7 summit was hosted by Japan at Shima, Mie Prefecture. The G7 leaders aim to address challenges affecting the growth of the world economy, like slowdowns in emerging markets and drops in price of oil. The G7 also issued a warning on the United Kingdom that "a UK exit from the EU would reverse the trend towards greater global trade and investment, and the jobs they create and is a further serious risk to growth". 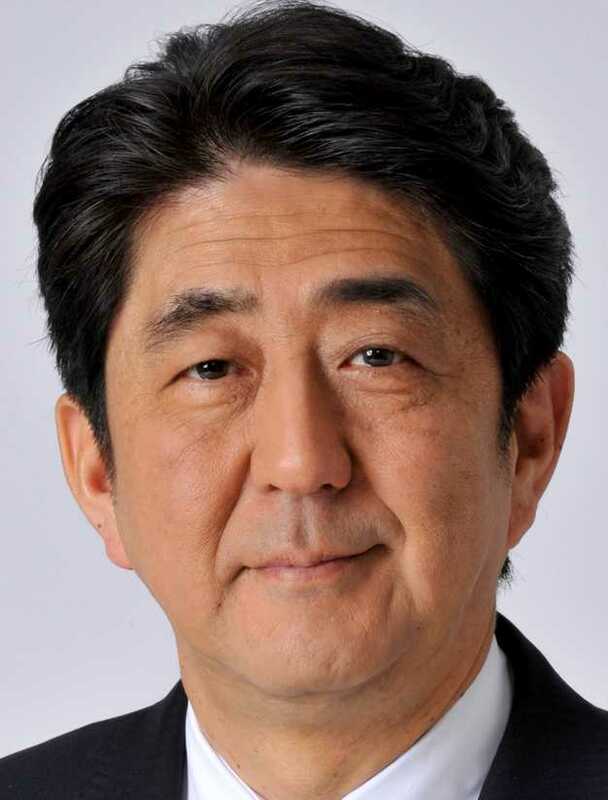 Commitment to an EU–Japan Free Trade Agreement. 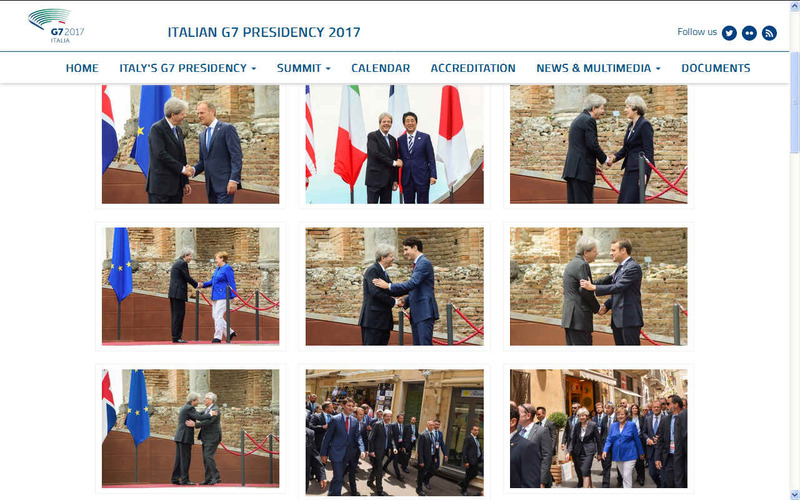 In 2017, the 43rd G7 summit was hosted by Italy at Taormina, Scicily. G7 leaders emphasized common endeavours: to end the Syrian crisis, to fulfill the UN mission in Libya and reducing the presence of ISIS, ISIL and Da'esh in Syria and Iraq. North Korea was urged to comply with UN resolutions, Russian responsibility was stressed for Ukrainian conflict. Supporting economic activity and ensuring price stability was demanded while inequalities in trade and gender were called to be challenged. It was agreed to help countries in creating conditions that address the drivers of migration: ending hunger, increasing competitiveness and advancing global health security. 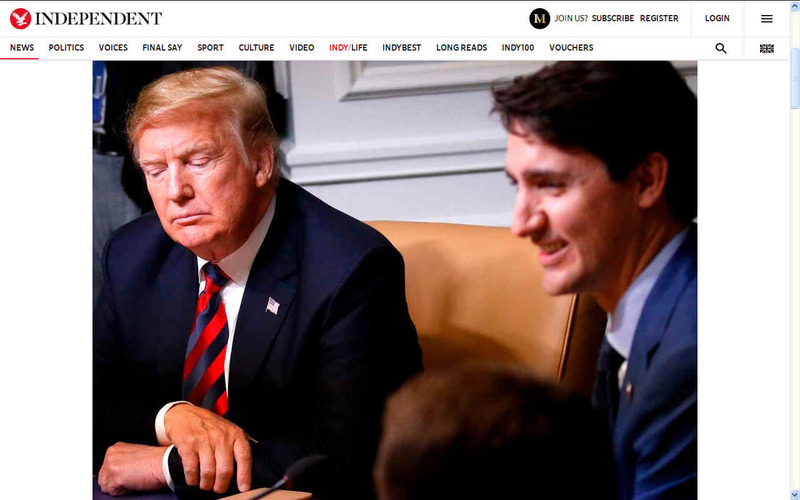 In 2018, the 44th G7summit was hosted by Canada. It took place at the Manoir Richelieu. 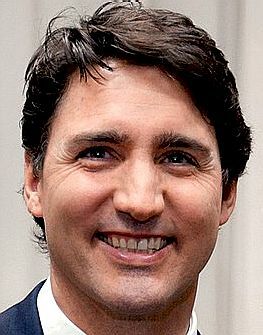 Prime Minister Justin Trudeau announced five themes for Canada's G7 presidency which began in January 2018. Climate, along with commerce trades, was one of the main themes. “Working together on climate change, oceans and clean energy” The G7 members' final statement contains 28 points. 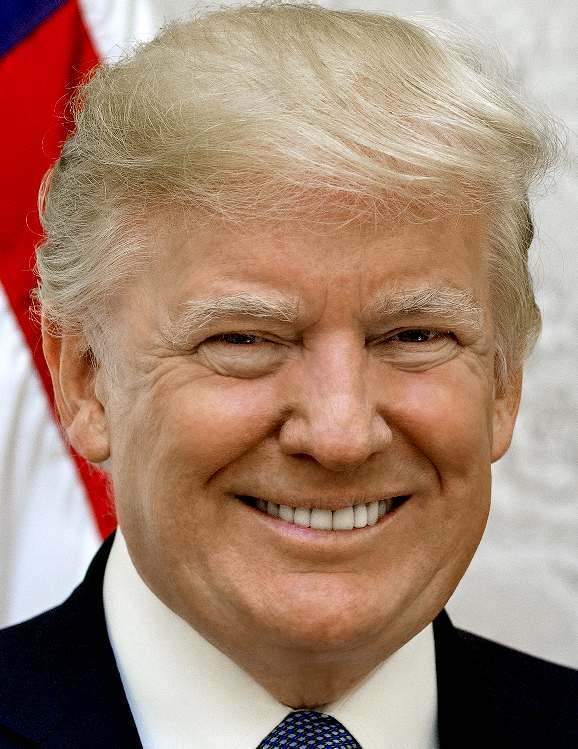 US President Donald Trump didn't agree to the economic section of the final statement. 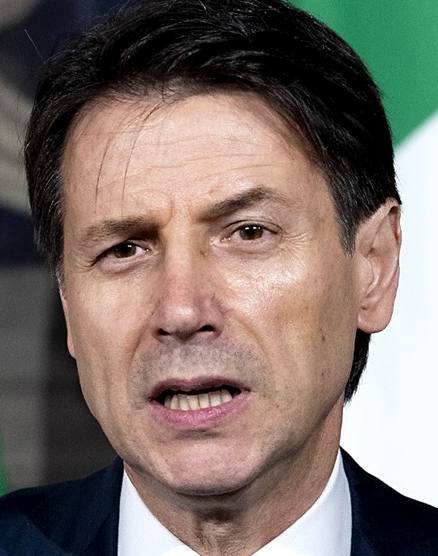 The G7 members also announced to recall sanctions and to be ready to take further restrictive measures against the Russian Federation for the failure of Minsk Agreement's complete implementation. 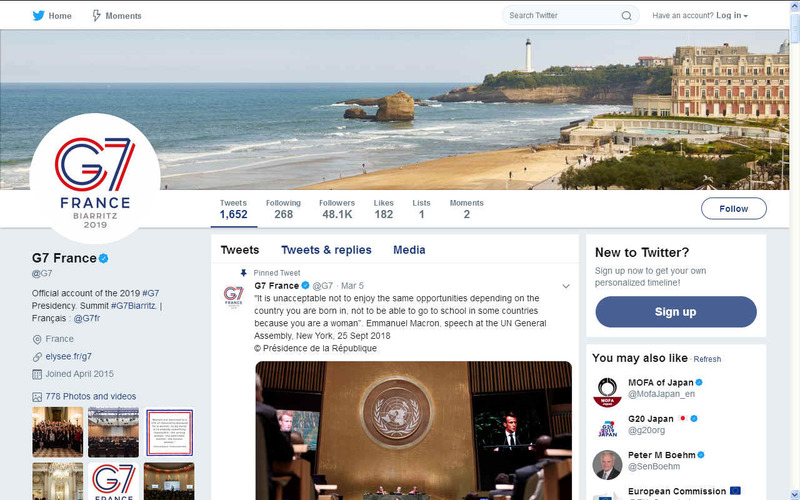 In 2019, the 45th G7 is to be hosted by France at Biarritz, Nouvelle Aquitaine. Subjects likely to be on the summit agenda could include: Global Warming, International Trade, Sustainable Economies, Food Security and Ocean Pollution.